On August 11, 1950, Ethel Rosenberg was arrested on the charge of conspiracy to commit espionage against the United States. Her husband, Julius, was arrested a month earlier. They were accused of passing along top-secret information about the atomic bomb to the Soviet Union. The trial began in 1951 on March 6, and the jury convicted Ethel and Julius a few weeks later on March 29. Judge Irving Kaufman sentenced the two to death in the electric chair. The Rosenbergs’ attorney, Emanuel H. Bloch, fought for an appeal for two years. Ultimately, his appeal attempts failed. During the two years of appeals, United States citizens and others across the globe were split on their feelings toward the couple. Some regarded them as traitors, while others saw them as victims of McCarthyism and the hysteria of anticommunism. For the latter, the death penalty seemed too cruel of a punishment. On June 13, 1953, the Supreme Court denied the Rosenbergs a stay of execution. The couple’s punishment was to be administered on June 18, but Justice William O. Douglas granted them one last stay of execution after a Tennessee lawyer, Fyke Farmer, argued that the court tried the supposed spies under the wrong law. After years of delay, those Americans who saw the Rosenbergs as traitors thought the decision by Justice Douglas was also an act of treason. Senator Gore responded to many of the letters on June 19, 1953–the same day the Supreme Court overturned Justice Douglas and ordered the execution of the Rosenbergs that evening. In his response, Gore stressed the seriousness of the death penalty and the responsibility of the justice system to ensure that “every accused is innocent until he is proved guilty beyond a reasonable doubt.” He acknowledged that the two years of appeals following the Rosenbergs’ conviction and sentencing may have been “unusual,” but he reminded these constituents that “no time, effort, or patience is spared to see that defendants have every opportunity to take advantage of all reasonable efforts to establish” reasonable doubt. He also refused to speak lightly about whether or not Justice Douglas should be impeached. 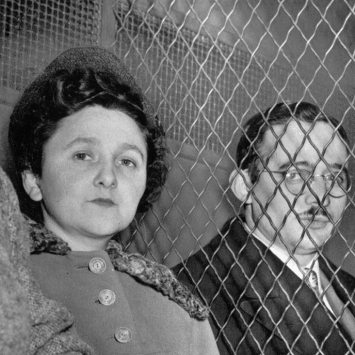 Proclaiming their innocence right up to the time of their deaths, the Rosenbergs were the only American civilians to be executed for espionage activity during the Cold War. These documents demonstrate how some Tennesseans responded to the court’s actions, and how Senator Albert Gore Sr. emphasized the importance of due diligence in the criminal justice system. Note: all documents came from the Albert Gore Sr. Senate Papers, Special Files Series. This entry was posted in political collections and tagged communism, ethel rosenberg, julius rosenberg, tennesseans respond. Bookmark the permalink.